If you’re studying Spanish or volunteering in Cusco and decided to stay here for this upcoming Christmas, don’t feel glum about missing out on family traditions back home. Cusco offers an array of exciting new traditions to explore and adopt as your own. One of these are the Christmas markets that are held in nearly every plaza in the city. 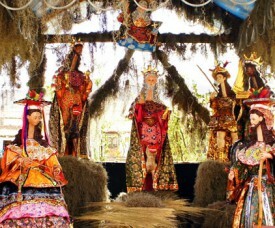 The most famous is the Santurantikuy Christmas market held in Plaza de Armas, the main square in the center of Cusco, for the whole day of December 24th. While this market is a must for all visitors to Cusco for the Christmas season, we also recommend that you head out before Christmas Eve and checkout some other Christmas markets that start before hand. 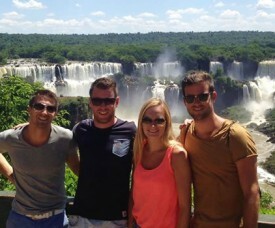 Highly Recommended Weekend Trip for Students: The Iguazu Waterfalls! I have been learning Spanish in Buenos Aires now for several months, since I’m doing an internship here in Argentina. I love Buenos Aires and I have already seen a lot of amazing things in this country. Last weekend, however I returned from a trip to truly unique lanmark. The sounds, the colors, the huge expanse it is a combination of everything, which make this waterfall unique.I didn’t know it was possible to enjoy this quantity of liters and liters of water falling. It is obviously why the Iguazu Falls are one of the Seven World Wonders, together with Machu Picchu in Peru, among others. After having spent almost five months (!) 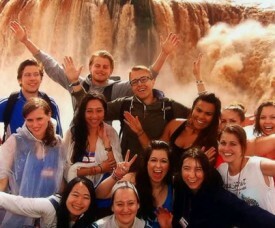 in Cusco learning Spanish, it was time to go on a new adventure. 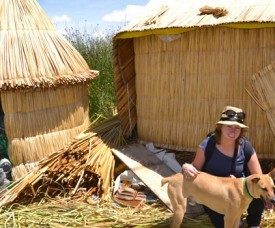 Together with a friend from home, who had just joined me, I decided to head to Puno. Known for its location right at Lake Titicaca it is a great place to start your trip to the floating Uros islands or to one of het other islands such as Amantani or Taquile. Christmas is coming…. to Cusco, Peru! 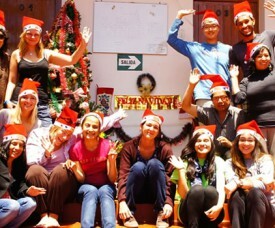 Take part of our Christmas Spanish Course at AMAUTA Spanish School in Cusco! This course does not only include Spanish classes but also cultural activities, all about living the Peruvian culture in the Christmas period. Besides learning Spanish, you will experience the special Christmas time in Cusco, even more if you decide to live with a local Peruvian host family. But also the AMAUTA School Student Residence will be full of Christmas decorations and activities. Great discount on Spanish classes: pay three, get four! If you are thinking about taking a Spanish course in either Peru or Argentina in January of February 2015 you are so lucky! AMAUTA offers now this great discount option: if you book thre weeks of Spanish Group course, you get an additional week of Spanish classes for FREE! All you have to do is register for your Spanish classes online with the discount code: 4×3. Now you will pay only USD $ 420 (Cusco) or USD$ 690* (Buenos Aires) for a complete month of Spanish lessons including free activities such as a walking tour in town and a welcome dinner (Peru only), dance lessons, visits in the city, cooking classes and others. A visit to Moray and the Maras Salt Mines! When you follow a Spanish language course at AMAUTA Spanish School in Cusco, you have the opportunity to follow part of your Spanish lessons in the Sacred Valley of the Incas. This way you combine different locations and travel to differet places where you can continue your Spanish course. You can even go to the Amazone and continue your Spanish course in the Rainforest.That sounded very appealing to me so I signed up for one week of Spanish classes at the Sacred Valley campus. During this week we visited Moray (Inca ruins) and the Maras Salt Mines with AMAUTA staff as part of our program, that consists of Spanish classes, accommodation with all meals, activities and tours.